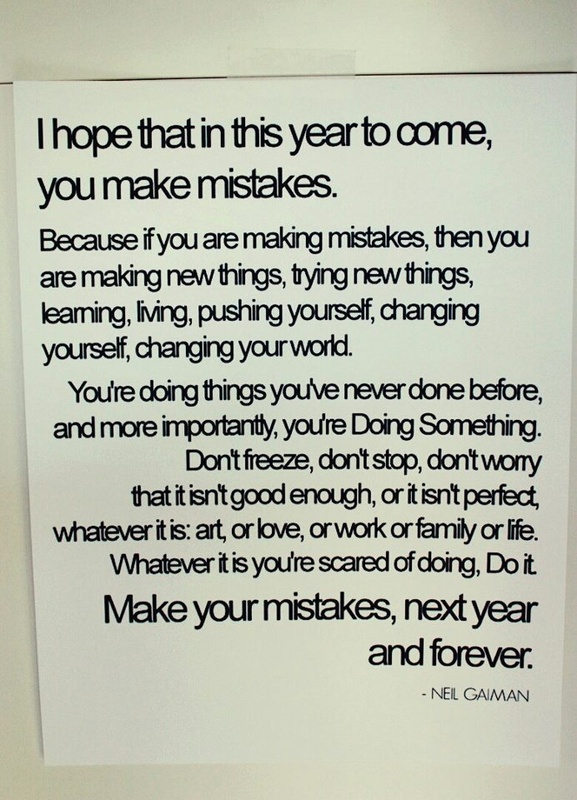 I made a lot of mistakes in 2013. And I loved every one of them. My definition of a “mistake”: something that happened either voluntarily or completely by chance that did not work out as planned, yet taught me an incredible lesson. I certainly had my fair share of… interesting… dates in 2013. I challenged my own norm in terms of age, personality types, physical appearance and everything in between. Did any of these wacky dates turn into the love of my life? No. But they challenged me, made me think outside of the box, and gave me some hilarious stories to tell at the bar. The lesson? If you’re single, look at dating new people as an opportunity to learn something about yourself that you wouldn’t have otherwise known. If you’re taken, feel free to play cupid and send me the love of my life. Thanks. I added a lot onto my plate this year. And I mean that both metaphorically and quite literally. As I added commitments, I simultaneously disregarded my healthy eating habits and more often than not chose to eat based on what was convenient with my crazy schedule and lack of effort. The lesson? Sometimes you need to fall down in order to realize how important getting back up is. Take care of your body. It’s the only one you’ve got. This mistake of mine drove me insane in 2013, mostly in a good way. Every time someone proposed an opportunity, favor or inkling of a fun adventure to me, I said yes. While I do not regret a single time I agreed to these situations, I think I finally realized that learning to say “no” can be just as valuable. The lesson? It’s important to evaluate what you’re committing to before you agree to it. This one is a doozy. Reigniting an old flame, to me, has always been a mistake. Not only are you a different person than who you were when you first dated someone, but there was a reason it ended. Yet sometimes you have to reignite a flame in order to put it out once and for all. Just don’t be an idiot and reignite it more than once. The lesson? Playing with fire does nothing but burn you. I view this one as a mistake and a blessing at the same time. I’m always going to be a straight shooter. It’s just how I’m programmed. Yet this year I realized that I wouldn’t have to be as direct about how I felt if I didn’t let myself get so wrapped up into a situation in the first place. The lesson? Say what you mean as soon as you’re sure of it. Don’t wait to let it escalate into a trickier situation than it needs to be. Like I’ve made note of before, I made mistakes when it came to my friendships this past year. I relied on past history to make old, very worthwhile friendships last, and that is no recipe for a successful relationship. Fortunately they weren’t too far gone to fix. The lesson? Invest in the relationships that mean something to you. It’s that simple. Like most twenty-somethings, I fell victim to being an idiot with some of my finances this year. The past few months I have become hyper-aware of this, and after saving and booking two trips for this February, I felt a sense of accomplishment that I want to continue. The lesson? Donate clothes you don’t wear, be creative with your income, save your money for experiences and investments that matter, and stop going out to eat so much. I could write a novel about all of the ridiculous mistakes that i’ve made simply because I snoozed one-too-many times or slept in too late. I would have saved hundred of dollars in parking tickets (I want to cry as I write that) and a lot of anxiety if I just got up at the right time. I did this one too many times in 2013. I put all of my effort and heart and soul into one project or opportunity just to have it not work out. I’ve learned the past few months to push myself not just to the outskirts of my comfort zone, but way the hell past those barriers. I like to think that I live with little reservation or fear, but in retrospect, I could branch out and explore new opportunities much more. The lesson? While it can be exhausting (like everything else in life that’s worthwhile) it’s important to consider all options, especially ones that scare the living daylights out of you. Some of my absolute favorite mistakes this year happened when I least expected them to. They threw my original plans completely off course, changed everything else I had lined up, shook my faith and made me wonder what the hell I was supposed to do. It was scary. I messed up. I second guessed myself. And I loved it. The lesson? When something sneaks up on you and tugs on your heartstrings in the best of ways, don’t be a fool and let it pass you by. Embrace it. Challenge it. Fall in love with it. 2013, you’ve been quite the roller coaster ride that I forgot to wear my seatbelt on. 2014, bring it on, baby. The answer to that question is no. I moved to Buffalo roughly six years ago for college and was fortunate enough to have a job offer in the city before I graduated. I have only just begun to scratch the surface of its history and culture. Yet I am completely captivated by Buffalo. I don’t just love this city, I adore it. When I’m not shamelessly promoting Buffalo, I’m doing my best to listen and learn more about the city that has fostered my growth these past few years. Ask anyone who has taken the time to learn about the quirks of Buffalo — like how Hoyt Lake serves as the perfect backdrop for both a wedding and an afternoon run; how the developments downtown reinvigorated a conversation that has been long overdue; how getting stuck in traffic really only puts you a few minutes behind schedule; the way a stranger always helps get your car out of the snow after a bad storm. Buffalo is named the “city of good neighbors” for a reason. You can feel it when you’re here. There’s a lack of judgement and an abundance of stories just waiting to be told. The same could be true for your city, too. She was right. I believe you can find ways to make any location feel like home. Maybe I’ll live in Buffalo my whole life, raise my kids here and show them the same love for this city that others showed me. Maybe I’ll move to a different city and fall in love with that place, too. Yet how long I stay here doesn’t matter as much as what I do with the time that’s right in front of me. Because when you’re fortunate enough to have home be a place filled with such kind, witty, generous and charismatic people like those from Buffalo, you’d be a fool to not consider yourself lucky.